Earn 3649 loyalty points when you order this item. Anthem STR Preamplifier is a new type of audio component that gives you better control and greater refinements including more connectivity and further advanced technology in a one-box simple to use component. This combines the benefits of an advanced preamp with the power of a processor and functions like leading-edge DAC, onboard Anthem Room Correction (ARC), customizable bass manager for mono or stereo sub outs, MM and MC phono inputs—far more than the average preamplifier. It includes new generations of many of Anthem’s award-winning, audiophile-loving, review-praised digital signal processing innovations, delivering a noticeably higher level of audio performance realism. The new STR Preamplifier drives all of your entertainment options today, and tomorrow. The STR includes the newest and most powerful generation of ARC with 50% more processing power than any other version. 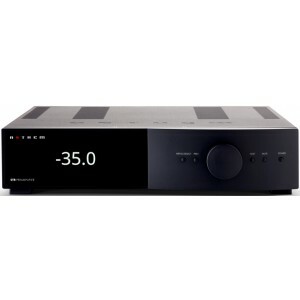 Other innovations include a high- resolution preamplifier and digital section, which supports asynchronous USB up to 32-bit/384kHz PCM and DSD 2.8/5.6MHz sources, and uses signal processing that employs 64-bit accumulation and feedback to preserve the finest detail in the music and to avoid degradation. The DAC section was designed to faithfully duplicate all the sounds in the original source. To help achieve that effect for all input resolutions, a dedicated asynchronous 32-bit/192kHz sample rate conversion is used. This way, the DAC stage’s anti-imaging filter is optimised for this sampling rate alone, resulting in an audio frequency range that’s unmatched in purity, regardless of input format. In the process, the data gets reclocked, providing immunity from performance-marring source jitter. STR Preamplifier includes a high-resolution preamplifier and a digital section, with support for asynchronous USB up to 32-bit/384 kHz PCM and DSD 2.8/5.6 MHz sources. This high-quality USB audio input transforms digitally stored audio from your Windows or Mac computer into warm, natural analogue sound. STR Preamplifier is designed, engineered and manufactured in Canada and is part of premium STR Series by Anthem, the leader in audio power and control. Through the rest of the DAC circuitry, thin film high precision resistors and super low noise op-amps are used for lowest distortion, lowest noise, and most transparent sound. Other DAC units may boast about the performance of the DAC chip, but Anthem's DAC stage is designed as a whole eliminating crippling bottlenecks anywhere in the DAC stage. The display on the front panel gives you simple control through an easy to navigate setup menu. The elegant contemporary design is available in two beautiful finishes, Black or Silver. Anthem has also taken into consideration the resurgent popularity of vinyl records and has included separate inputs for moving magnet and moving coil cartridges, with the phono section completely shielded to maintain a clean signal. The transparency and refinement of the STR Preamplifier reveals the hidden magic of classic media. In addition, the phono curve is continuously adjustable for proper playback of any record that predates the RIAA equalisation standard. The concept of combining a stereo preamplifier with a home theatre system is taken to a whole new level. 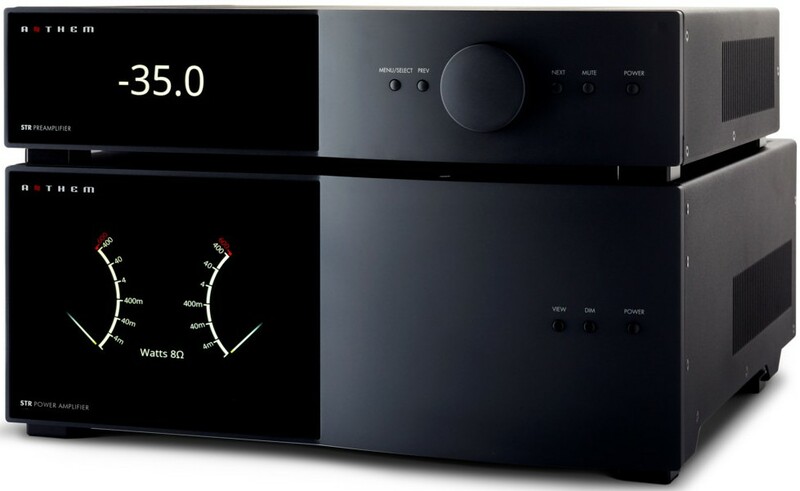 The STR Preamplifier supports two subwoofer channels in addition to the two fronts. XLR, along with RCA connection, is provided for all channels, and HT Bypass mode engages while the preamp is on standby. This way, you don’t have to turn it on when watching movies. To allow the purest signal path, relays are employed to hard-wire the input jacks to the outputs, the STR Preamplifier essentially becomes a straight wire. Anthem Room Correction (ARC) is a proprietary digital signal processing system that allows you to quickly and accurately optimise the performance of your audio equipment to better suit the unique parameters of your room. By listening to your room’s acoustic signature, ARC can tune your equipment to correct for the performance-robbing effects (reflections, resonances etc) of the various surfaces and other obstacles in your room. Automatically shaping the acoustic signature of your speakers allows for best possible sound quality in your unique listening space which is especially important for the lower frequencies. Clarity is maintained using carefully selected components, many of them engineered exclusively in-house at Anthem. Anthem believe that two-channel listening demands attention to detail, with flawless signal integrity being the benchmark of stereo performance. To that ultimate end, the Anthem STR Preamplifier is designed with the shortest possible signal paths, and differential analog to digital circuitry to cancel artifacts and keep noise to a minimum.